Even if you have a concealed carry permit, many places prohibit guns, like federal buildings, churches, or private businesses. Installing a small, portable gun safe in your car can secure your gun while you run into the post office, pick up kids from school, or go anywhere else where keeping your gun with you is not an option. I like the GunVault MV500-STD because it fits underneath my driver’s seat and has enough space inside for my gun—a 9mm STI Elektra 1911—and an extra magazine, pocket knife, or something of similar size. It’s compact, but with enough space for what I need. I use this safe in my car and confidently recommend it to anyone who asks. 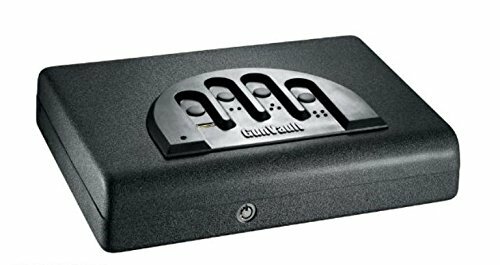 The GunVault MV500-STD uses a digital “no-eyes” combination locking system for quick access.“No-eyes” means you don’t need to look at a number pad to enter your combination. Instead, the four finger slots built in to the keypad help you position your fingers so you can open your safe without looking, which is great for reaching under the seat or accessing your safe in low light. GunVault has created an original pattern combination design with over 12 million programmable access code combinations. By entering in a pattern instead of a numbered code, you have the ability to make your combination unique and more difficult to crack. GunVault also includes backup override keys in case you forget the combination or the battery runs out before you can replace it. I like car gun safes that anchor using a security cable. They are way easier to install—no drilling and bolting—and they allow for a little movement if you need to adjust positions or pull out the safe while using it. The MV500-STD comes with a steel security cable that can withstand up to 1,500 pounds. A combination of security and accessibility makes the MV500-STD my top choice for the best gun safe for your car. You might have a difficult time fitting this safe somewhere in your vehicle where it can be both concealed and easily bolted down. 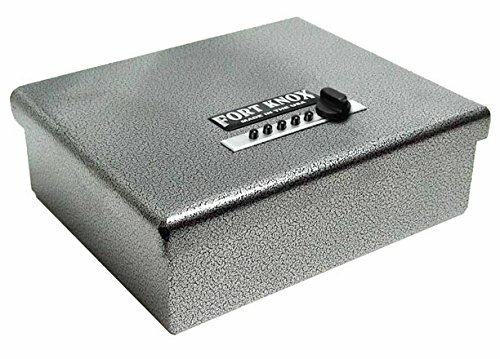 While the Fort Knox PB1 gains points for strength and security, it loses points for inconvenience and inaccessibility. The safe opens from the top, so you won’t be able to access it if it’s bolted underneath a seat. Because of its size, you’ll have to mount this safe where you’ll have clear access from the top, like in the trunk. If you’re not comfortable relying on a battery-powered digital keypad, the Fort Knox PB1 uses a push-button mechanical combination lock that’s not quite as fast and easy to access as the MV500-STD but is smooth and reliable nonetheless. The Fort Knox PB1 has fewer combination variations than the MV500-STD—it has 1,081 to be exact—but it’s made of heavy-duty 10-gauge steel and is practically impossible to break in to. This is easily the toughest safe on our list and only misses the top spot because it’s bulky and difficult to mount. The Fort Knox FB1 has four pre-drilled holes in the bottom so you can bolt it down to any surface. That being said, it can be a difficult process to bolt the safe into your vehicle in a spot that makes sense. The Fort Knox FB1 is difficult to open underneath a seat, and putting it in the trunk won’t allow you quick access. Convenience is a big reason I chose the MV500-STD over the Fort Knox FB1. But if you’re looking the strongest safe available and don’t mind doing some extra install work, the Fort Knox is a great way to go. Slightly wider than the MV500-STD, the Gunbox 2.0 will easily fit underneath the seat in your car. The lid can be adjusted using a plastic stop block (included) to restrict opening to 45 degrees. This will help if you’re mounting it under the seat or upside down under the dashboard in your car. The Gunbox 2.0 goes for a more high-tech approach, using both a biometric fingerprint scanner and RFID technology. The Gunbox includes two key fobs and two access cards, and for an extra $69.99, you can get an RFID ring to access your safe via RFID. Alternatively, you can use the biometric feature and program up to 100 different fingerprints. 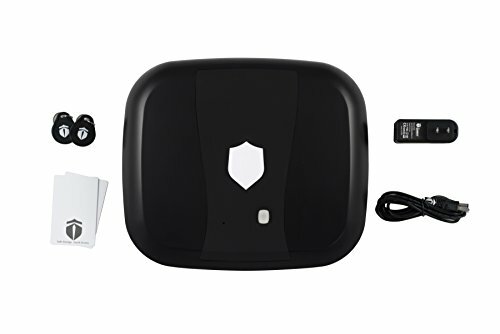 The Gunbox 2.0 has added Bluetooth access through the SafeTech smartphone app, which allows you to adjust fingerprint sensitivity, change alarm sounds, and enable password requirements for added security. The Gunbox’s emphasis on technology means it needs a power source to work. You can rely on its rechargeable battery, which can last up to 18 months, or you can plug it in using one of its two USB ports. Overall, it has a very James Bond feel to it, so if you’re into high-tech security for your firearm, the Gunbox 2.0 won’t disappoint. I recommend buying a security cable tether to anchor the Gunbox 2.0 under your seat, but it can also be mounted just like the Fort Knox PB1. Cables give you more range of motion when accessing your safe. However, because the Gunbox uses tamper-proof technology that sounds an alarm if bumped or moved, you might need to do some adjusting to make sure you don’t set off your alarm by accident. The Gunbox 2.0 is the most advanced option on our list. If you’re looking for cool, quick-access technology with some added safety features, the Gunbox 2.0 could be worth the added expense. 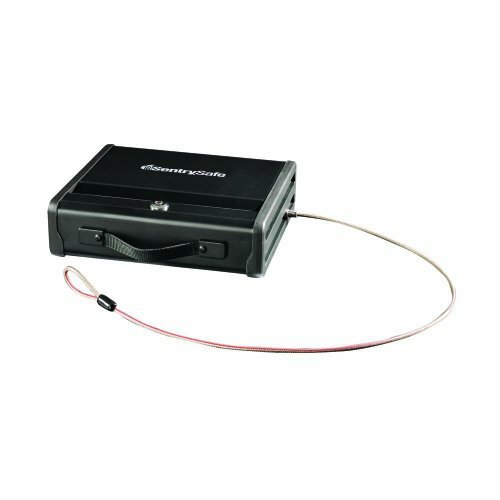 If you’re looking for small, basic protection, the GunVault NV300 NanoVault will fit almost anywhere you want to conceal it in your vehicle and comes with a security cable so you can anchor it down. This won’t stop a determined thief, but it will definitely prevent a criminal from getting to your firearm in a smash-and-grab theft. Personally, I’m not a fan of key-entry safes because the keys can be lost or stolen, but the SentrySafe PP1K is pretty much the same thing as the MV500-STD without the digital pattern combination keypad. If you don’t mind using keys, this is a safe you should definitely look into. You want to feel comfortable leaving your gun behind in your car, and knowing what makes a quality gun safe can help you feel a sense of security. I looked for three things in particular when shopping for a gun safe for my car. Size (consider length x width x height)—Look for something that fits under the seat or dashboard and is easily concealed. Someone passing by and looking through the window shouldn’t be able to see your safe. Type of lock (security and ease of access)—Look for locking mechanisms that are reliable, secure, and easy to operate to allow yourself easy access to your firearm while securing it from a smash-and-grab theft or curious child. Anchor (attaching the safe to your vehicle)—Most car gun safes are light enough to be carried off, so find a safe that can be anchored down. Whether that means getting a security cable tether or bolting the safe directly to the floor of your car, you need something the attaches your safe to your vehicle. Keep in mind different states have different laws about when and how you can carry a gun. What’s legal in Utah can bring heavy prosecution in California. Consider your state’s gun laws when purchasing a gun safe for your car. Choose a safe that you are comfortable using. If you’re skeptical about newer technology like biometrics and RFID, then go with the MV500-STD, Fort Knox PB1, or another safe that you feel comfortable leaving your gun in when you can’t keep it on your person. Any safe on this list is better than leaving it in your glovebox or unprotected under your seat. Curious about gun safes for your home or other car security must haves? Check out our recommendations for Best Gun Safes or Best Dash Cams for more information.